Last weekend our neighbors were out of town, so I stopped by to check on their sweet lamb and make sure he had plenty of water and the fence was still on. Pierce came along with me. While I was busy checking Jacob the Lamb's water, Pierce yelled, "Mom, I found some cactuses!" I came over to investigate. After explaining the plural of cactus, I told Pierce about how my grandparents had a chesnut tree in their front yard when I was little. I showed him how to find the chesnut inside all the prickliness. We took a few back home, so that Pierce and his brothers could try them. I told them about the tradition of roasting chesnuts during the holidays. These had a few worms, so we had to work around that. But Pierce really enjoyed getting to try his first chesnut. It's Rural Thursday! Time for you to link up your tales of the rural life with Nancy from A Rural Journal and myself. Please copy the code beneath the button and paste it into your blog post. Then come back and link up your url in the linky. Don't forget to visit and comment on the blogs of at least 5 other participants today! Oh yum, I LOVE chestnuts! 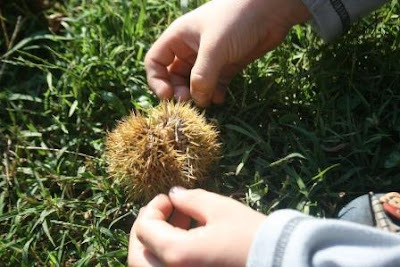 Growing up we called those prickly things "chinkypins". Looking it up I see it is written "chinquapin", an Algonquin Native American name. How sweet! So much to learn for the little guys and it won't be long until they are singing that old Christmas song. What a wonderful lesson for your boys! You're such a good Mom! And, I learned something, too--I've never seen chestnuts! I would never have guess that there were chestnuts in those prickly fuzzy balls. I have never tasted Chestnuts alas there are none on the farm but we have an abundant supply of black walnuts. we had a chestnut tree at our last house and dang, they ARE prickly! How fun to have "real" chestnuts! Great job, Lisa! We have these all over our yard and at the park. My son treats them like balls. I have no idea how to eat them, but I'm going to have to try. What a neat lesson for your boys. That brings back memories. When my sisters and I were walking through a field to a friends house we ran a cross some cactus and thought it would be neat to bring them home. Needless to say we were covered in tiny spines by the time were arrived home. I hope you have a great day. aww - I used to love to dig out the 'buckeye' when I was a child! Well you not only taught your son about Cactus...but me too!!! I didn't even know about chestnuts inside them!! Too funny. 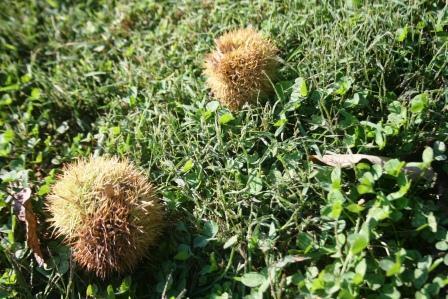 I don't believe I would recognize the differences between a chestnut and a horse chestnut, which we have tons of here. The squirrels LOVE them. Hi Lisa, well, I learned something new today too! After all this time, and eating them, I didn't know where or how they grew. Thank God for blogging! Lol. Thanks for sharing! I miss having our own chestnuts. When we moved from 100 acres to less than one, we gave up a lot of things I now miss. But..... we have a lot less work. We planted 6 chestnut trees this last spring. I mail ordered them. They were just little sticks when they arrived but so far 4 have lived! I think it makes it so special to eat when they find it themselves. So yummy! You gave the boys a great lesson! I can't eat chestnuts (allergic), but I think they're very pretty. I love chestnuts, beautiful pictures. Greetings. I've always loved chestnuts. We don't have a chestnut tree, but I scrounge them from people in town who do. They look pretty in bowls, set out as decorations too. It's cute that Pierce thought they were cactuses! Yummy...I love chestnuts. How cute that he thought it was cactus. Second time today I have seen a post on these chestnuts. I have always known them as buckeyes so I had to go to google. Learned that they look similar but are not the same. I have never seen them in this prickly layer before though. Thanks for coming by. I love your "cactuses" Would absolutely love to have some roasted chestnuts. They are delicious. What a cute little lamb. I had no clue about how the chestnuts arrive. I am learning along with Pierce! What a fun discovery to share together. Oh wow, what a find! I haven't seen those since I was a kid! You really are one great mom. That's so cool! Always a learning experience with kids! Now that is just plain fun! I'm glad they found the "cactus." Growing up we had a huge chestnut tree on our property. My Dad used to shell them for us. I loved them. I can sense the taste of them just thinking about it. I love that Pierce compared them to a cactus - priceless. Glad that I saw this, I put some in the refrigerator last week and I need to plant them. I planted some a couple of years ago and now 2 of them have really grown beside our driveway. They can be a messy tree but I do like the nuts as do all of the animals. They are wormy though but a little extra protein is good I guess. Thanks for hosting...love the story about the chestnuts. Would love to hear how you roasted them too. I'm a new follower, looking forward to more posts! 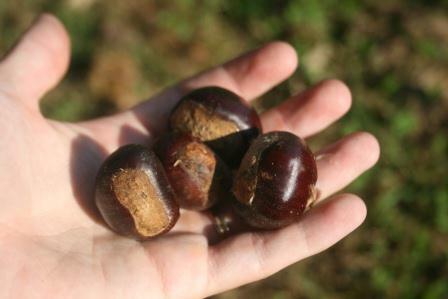 We have those chestnuts too! 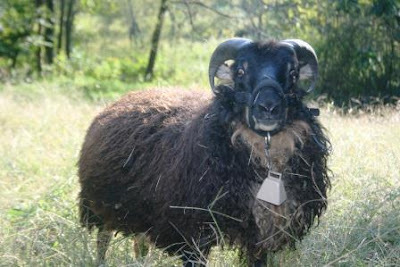 And that sheep- we saw one like it at the wool festival last weekend! I need to buy some chestnuts. I love them roasted. When we were kids, we had a coal furnace and would roast them on the registers. I've never eaten or seen a chestnut. Your boys have such wonderful adventures! that is rural alright. a fun meme to see! Too cute, love his comment... are these the edible ones? ?